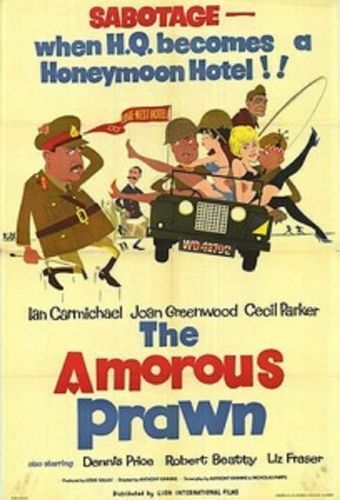 Based on Anthony Kimmins' stage success The Amorous Prawn, this British light comedy stars Joan Greenwood as the wife of an Army general (Cecil Parker). Having fallen upon hard times, the wife hits upon a scheme to raise some quick cash. She opens her husband's highland headquarters to visiting salmon fishermen, a circumstance that displeases the general when several of those anglers turn out to be handsome young men. On the assumption that American audiences would think The Amorous Prawn was a film about shrimp instead of salmon, the US distributor added the "Mr." to the original. When filmgoers failed to respond, the picture was re-retitled The Playgirl and the War Minister, a shameless attempt to exploit the then-current Profumo political scandal.